Morgan owners often note with rueful pride that they can distinguish the difference between heads or tails when driving over a coin in their Mog. I have my doubts as to the advantages of this sensory system when bouncing about on our Canadian country roads. The Canadian fact of small road heaving during the wild climate changes of our country provide sterner stuff to navigate than the pleasant rural experience one finds in most of Morgan's native Britain. I am not suggesting that our larger and newer divided highways are all pot-holed but our smaller country lanes have a special...er... "complexion" from winter heave. At the same time, Morgans should be at their best on winding country tracks. My experience with snowmobile suspension designing has shown me that one's range of pleasure and possibility improves with a suspension capable of taming the track. The better the suspension the more stretches that will become joyful adventures rather than a flirt with danger. My car came with lever arms. They were not up to the task. I looked to other solutions. There are two groups of these so far. One is the MMC system and the other is an early Rutherford design called the Rutherford kit. I have used six rear systems on three Morgans, the lever arms, the early MMC hoop, the Rutherford Kit, a modified Rutherford style kit I made myself, the later MMC hoop (2003) and a Rutherford hoop (2005). This is an early design (1960s) by David Rutherford, the legendary Morgan Suspension guru. It is still made by David and copied by Melvyn Rutter. It fits all trad Morgans (there is a version for four seaters). It consists of two new U-bolt saddle plates with shock posts attached and two large metal bracket side plates (with shock posts at the top) that affix to the sides of the frame forward of the rear wheels. They can use the four lever arm holes that are pre-drilled (check your car, you have them) but with the codicil on travel I mention below. There is an aluminum 1 inch angle iron that attaches to the top of the brackets and straddles the car behind the cab wall. The bracket placement allows for much more space for shock "travel" over the first hoop systems and the shocks are more upright (good!) without inward angling, but rather a bit of forward angling. (The best angling would be a 10-15 degrees towards the rear but there is no space for that. The shocks you use with this kit are stock at your option. I first used it with Spax adjustable gas shocks. Adjustable shocks allow the driver to easily change the ride of the car to suit his taste though, frankly, the softest or near softest setting are the ones to use with Morgans whether you are using Spax, Koni or Rutherford Avos. I purchased Spax shocks (G464 HN) with the first kit. Konis are great shocks as well but they can only be adjusted ONCE where Spax and AVOs can be adjusted on the car in seconds. Since 2006, there are AVO shocks designed by Rutherford and made specifically for him and his dealers. Contact Heart of England Morgans.. Installation is fairly straight forward. 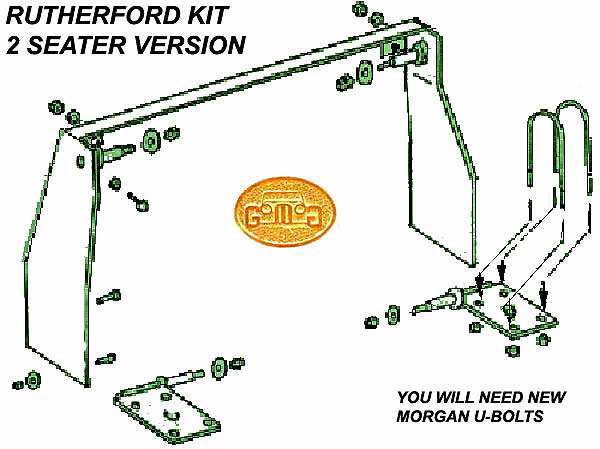 The kit was originally made to replace the Armstrong Lever Arm Suspension fit by the Factory up to 1990. Use those holes. But first, go to a machine shop, (NOT a hardware store) with the side plates in hand and buy the strongest bolts and lock nuts they have, preferably #8's or better. These bolts are NOT included with the kit. Don't forget you will need two extra bolts and lock nuts for the cross white metal bar. Secondly, remove the large U-bolts straddling the leaf springs and pull the bottom plate. Replace the bolts and the plate with the new ones making sure to place the bracket properly (a diagram is provided with the kit). You jack up the differential if you need more space to access the plates' nuts. Take special care to insure the each nut used is a nyloc and is properly placed to tighten down completely. If the nuts are tightened unevenly, one or another will leave a tiny space to give you slippage problems. Next, loosely attach the side plates to the two bottom holes on each side of the chassis just forward of the wheels. There is an important point here to verify if you wish. There is a common failing with all systems, MMC, Rutherford or Rutter. The distance between the shock posts must be such that the shock when installed is halfway between its fully compressed and fully extended states. If not, you will lose some of your ability to compress or extend. As the hoops and lower posts changed and/or each Morgan is not exactly the same as another, (considering the ride height changes over time (especially the first year of spring life), any shock post placement should be verified regularly and ALWAYS at installation. With the early Rutherford kits, you can adjust the shock post position by placing the side plates where they will be ideal for the shocks. With the other systems, you must match shocks to the right hoop. Measure your shock's length fully extended and fully shut and determine the mid-point length. Measure the distance from the saddle plate (u-bolt plate) post to the side plate post and, ideally, it should match. Now, attach the other two bolts per side and tighten all of them. Then attach the cross bar to each of the plates where indicated. You will have to drill the holes in the cross bar but this is not a problem with the appropriate metal bit. You MUST tension the brackets inwards a bit to mark the drill holes on the cross bar. (If the tops of these brackets are not "tensioned" inward by the angle iron they will move from side to side to sad effect). N.B. MAKE SURE THE LEAF SPRINGS CLEAR THE BOLTS. I had a friend who had my kit installed for him and couldn't figure out why he was "bottoming" on one side so easily. They had left the bolt sticking out in the way for the up and down movement of the leaf spring. Attach your shocks with their rubber mountings, in a manner to easily access the adjustment screw. Do not over tighten the shocks' bolts as if you start to crimp the rubber mountings this will affect the shock's performance. Adjust each shock up to the softest, put on your wheels and off you go for your test ride. You can adjust the shocks to your liking but softest is the best setting for the rear on all shocks. The ride will feel weird at first but you will quickly adjust to the added comfort as the shocks handle the road anomalies and your car seems to float over the bumps. Lastly, put the car back up on the jack stands and re-tighten every bolt once more. Some will need it. The specific cost of these kits, quality shocks and new u-bolts cost 300 pounds and a slow day for an amateur in installation time. The Rutherford Kit has side brackets at 1/8 inch thick in quality steel, the Melvyn Rutter Kit is made from 3/16 inch in a mild steel. My redesign made the side brackets made to measure for my ride height, had the side pieces made in 3/16 inch alloy steel called "memory" steel which remembers its original shape and will bend temporarily rather than break. They have 4.3 times the strength of the commercial brackets. The lower bolt holes were threaded for ease of installation. With the graded bolts included, my kit cost me 125 pounds. In 1991, the Morgan Motor Company tried an improvement to lever arms. This consisted of an elliptical bracket (dubbed the "hoop") which straddles the rear compartment over the axle and which has fittings at both sides for the upper mount of the shocks and fits the lower mount at the rear of the wheel plates. The hoop crescent moons over the differential and attaches at each side of the chassis above the axle. The shocks angle INBOARD from the wheels to the hoop posts. I tried a 1992 version of this system first. I have little pleasant to remark upon it. It left too little travel for comfort and encouraged constant impacts between the differential and the hoop. The hoop passed less than one inch above the front of the differential allowing only that space of "travel" before they smashed together. In my case, the paint on both the underside of the bar and the top side of the differential disappeared and the pinion seal soon started to leak. British Agents have seen these bars actually flattened at the contact point with the differential. The fitting of the hoop concentrated too much stress at a weak point of the frame, and caused frame cracks over time. However, the later version (still used at present) improved mightily in the last 18 years and now incorporate a large rubber bump stop between the differential and the hoop. The travels space at that point has tripled and the hoop section at the frame now spreads the impacts. The shock angling is more vertical. 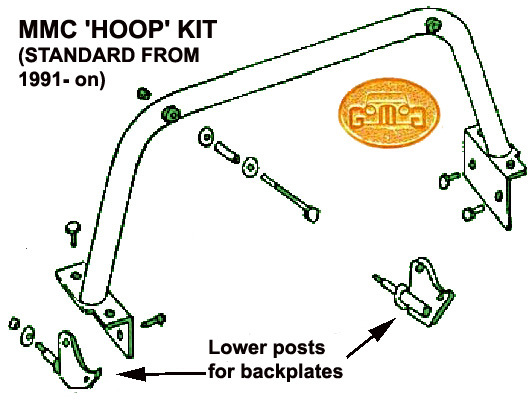 The MMC makes two versions of the hoop. Both of them are good. One must take care which shocks you purchase for any hoop system. The needed lengths may vary. Rutherford Engineering also has two hoop systems. One is similar to the MMC's and another allows for a much longer shock positioned and angled even more vertically. It is higher also above the differential than the MMC configuration and its bottom post is lower but for that reason, they need different dampers. They are great. I rebuilt my 66+4 rear suspension about 5 years ago. Used the Rutherford engineering individual towers "bolt on kit" made for the 4 seater (these fit in the original "shock boxes" in the rear footwells and are tied together using the "bar" that forms the front of the rear seat bottom cushion). I highly recommend the setup as it uses the "long" Koni's or Spax shocks (as Lorne notes this gives maximum travel). For the springs, when I rebuilt in early 90's I put in new 7 leaf springs then, when converting to the Rutherford system Dave Rutherford was kind enough to give directions on how to cut a 7 leaf system to replicate a 6. See below. you'll need to shorten the shackle bolts or have new ones made. Don't forget to grind the new cut edges and oil between the leaves.